"The 50th anniversary of The Texas Observer is a double celebration for me. Your first issue appeared one week before Judith Davidson and I were married in December 1954. We had transferred here to the University of Texas as juniors and were renting a garage apartment that has now totally disappeared along with the block on which it stood. So many landmarks of our lives have disappeared that it’s a joy to come back to Austin and find one that stubbornly and gamely remains true to its mission. Although many people would wish The Texas Observer had also been buried under the rubble of time, a good idea is as hard to kill as a good marriage. And this little newspaper was a good idea." Journalist Bill Moyers was the Deputy Director of the Peace Corps under founding Director Sargent Shriver. The 50th anniversary of The Texas Observer is a double celebration for me. Your first issue appeared one week before Judith Davidson and I were married in December 1954. We had transferred here to the University of Texas as juniors and were renting a garage apartment that has now totally disappeared along with the block on which it stood. So many landmarks of our lives have disappeared that it’s a joy to come back to Austin and find one that stubbornly and gamely remains true to its mission. Although many people would wish The Texas Observer had also been buried under the rubble of time, a good idea is as hard to kill as a good marriage. And this little newspaper was a good idea. We will have a good time and we hope you do. We will twit the self-important and honor the truly important. We will lay the bark to the dignity of any public man any time we see fit. Telling the whole truth is not an exercise to be limited to children before they reach the age of reason. It is the indispensable requirement for an effective democracy. If the press and the politicians lie to the people, or hide those parts of the truth which trouble the conscience or offend a friend, how can the people’s falsely-based decisions be trusted? Here in the Southwest there is room for a great truth-telling newspaper, its editor free, its editorials cast in a liberal and reasonable frame of mind, its dedication Thoreau’s ‘The one great rule of composition is to speak the truth. That was the lay of the land in the 1950s. And Democrats were in charge, remember? That’s right: Texas was a one-party state; Republicans were as scarce in high office as Democrats are today. No matter the players, one-party government is a conspiracy in disguise. So Judith and I graduated and left town. 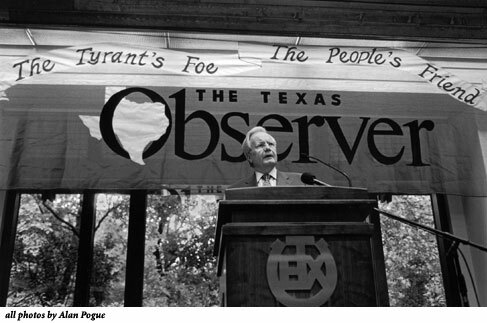 The Texas Observer stayed: stayed to live out Dugger’s dare to tell the truth about the oligarchy that governed Texas. What kept that original band of scribblers going remains a mystery to me. For sure they made up in irreverence what they lacked in financial security. At that very time, in faraway Washington,D.C., I.F. Stone was also afflicting the comfortable. In his little I.F. Stone’s Weekly, he would pour through the government’s own official documents to catch the government’s lies and contradictions. Amid the thunder of his battle with Potomac dragons he boasted, “I have so much fun I ought to be arrested.” Here in Austin, Dugger and friends were also just a laugh away from jail or bankruptcy. It took me a long time to catch up—to realize that what matters in journalism is not how close you are to power but how close you are to the truth. I had gone on to seminary, was catapulted into the Washington maelstrom, and then wound up as publisher of Newsday in New York, where I started to get my feet on the ground again. Then there were the writers whose creativity and courage buoyed many an article and essay: J. Frank Dobie, Roy Bedichek, Walter Prescott Webb, Bud Shrake, Garry Cartwright, Larry King, Larry McMurtry, Bill Helmer, Billy Porterfield, Elroy Bode, Amado Muro and Katherine Anne Porter, to name a few. In these pages, Lou Dubose predicted early on what would happen when the chickens of Reaganomics and (Phil) Grammonomics came home to roost, Robert Sherrill anticipated the rapacity of corporate greed in a new Gilded Age, and James Ridgeway imagined a perversion of populism that could serve multinational corporations even as they moved their operations offshore to exploit poor countries for cheap labor and raw materials, costing American workers their jobs. In these pages, Larry Goodwyn ruminated on the difference between “a politics of the present” and “a politics of the future,” urging liberals to think hard about whether their strategy meant a winning coalition 10 years down the road. Would the election next spring, say, of a “given liberal candidate in Dallas have any real meaning in altering the caste system under which the people of Dallas live?” The headline above that essay read: “Caste and Righteousness.” It was a startling headline at the time, and it still fits today, alas. As The Texas Observer continues to remind us, Texas in 2005 is run by the rich and the righteous, producing a state of piracy and piety that even the medieval papacy couldn’t match. The “advice” he offers is the same old stuff peddled by Robertson and Falwell in their own rise to the top of the dung heap of religious bigotry and bile. Parsley demonizes other faiths (“The god of Islam and the god of Christianity are not the same being”) and rouses the partisan faithful to fever pitch by tossing them the red meat of radical disinformation: “The church in America is under oppression.” “The separation of church and state is a lie perpetrated on Americans—especially on believers in Jesus Christ.” So intense is his scapegoating of gays that one cannot help but think of the 1930s when the powerful and the pious in Germany demonized Jews and homosexuals in order to arouse and manipulate public passions. 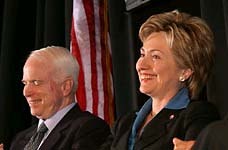 Watching the two of them together, you have to wonder if Gov. Perry and Rev. Parsley have ever read a history book detailing how Heinrich Himmler organized a special section of the Gestapo to deal with homosexuality and abortion, exhorting his country to remember that “Germany’s forebears knew what to do with homosexuals. 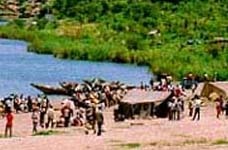 They drowned them in bags.” You want to believe the governor and the preacher are surely ignorant of such horrors, horrors you know they would never condone, but you want to grab them by the lapels and shake them and tell them their loathing of other people is the kindling of evil. So what was it that brought Rev. Parsley to Austin recently to meet with Gov. Perry? Both showed up for a “Pastors’ Policy Briefing” sponsored by the Texas Restoration Project (not to be confused with Reformation Ohio, unless you think of kissin’ cousins). Once again the aim is to sign up “Patriot Pastors” who will call on their congregations to vote the Lord’s will on Election Day. Also present in Austin was Ohio’s secretary of state, Ken Blackwell. You will remember him as the overseer of the election process in Ohio last year when a surge of conservative Christian voters narrowly carried Bush to victory there. Yes, the same Ken Blackwell who had modestly acknowledged that “God wanted him as secretary of state in 2004” because it was such a critical election. Now, apparently, he has been divinely designated for higher office. One wonders what Blackwell, Perry and Parsley were really talking about when they got down on their knees here in Austin. 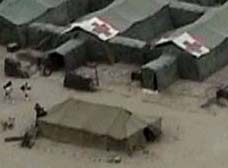 We will never know, because the praying and preaching and politicking were closed to the press, as befits the stealth salvation they are plotting for Texas. Who paid to bring preachers from all over the state to town for this politically religious camp meeting? That, too, is a big secret. Two Texas oligarchs were spotted at the closed-door sessions—James Leininger and Bo Pilgrim— and they may have dropped something into the offering plate. But no one will say who put up the half million shekels it cost to bring the brethren to town and provide for them more than a few loaves and fishes. Some years ago the classicist scholar, William Arrowsmith, writing in The Texas Observer, described the “worst of Texas attitudes—the rock-bottom conviction, expressed in stone throughout the state and in the hearts of politicians, that what counts is always and only wealth, that everything is for sale and can be bought.” Including now the Faith of Our Fathers, the Old Time Religion, the Rock of Ages. Right-wing religion provides the political and corporate forces running America a cloak of “moral values” with which to camouflage the plunder of America. It is the Texas machine duplicated many times over. For, as The Texas Observer once put it, “The men who run the Lone Star State, through a tacit but powerful interlocking directorate of politicians and corporation executives [joined now by preachers] are perpetrating and perpetuating a monstrous deception on the public” —namely, the illusion of self-government. Everything President George W. Bush knows, he learned here, as the product of a system rigged to assure the political progeny needed to perpetuate itself with minimum interference from the nuisances of liberal democracy. You remember liberal democracy: the rule of law, the protection of individual and minority rights, checks and balances against arbitrary power, an independent press, the separation of church and state. As governor, Bush was nurtured by the peculiar Texas blend of piety and privilege that mocks those values. With the election of 2000, he and his cohorts arrived in Washington like atheists taking over the Vatican; they had come to run a government they don’t believe in. The results have been disastrous: reckless tax cuts, a relentless assault on social services, monumental debt, pre-emptive war, an exhausted military, booming corporate welfare and corruption so deep and pervasive it has touched every facet of American government. Much has been made of the president’s inept response to Hurricane Katrina. His early response was to joke the fun he had as a frat boy in now-grieving New Orleans. 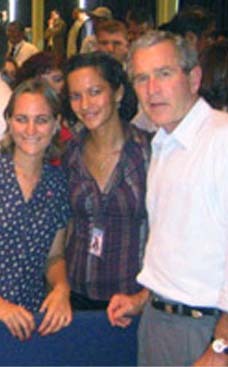 When a reporter pressed him on what had gone wrong after the hurricane struck, he sarcastically asked: “Who says something went wrong?” His attitude would surprise no one who read the 1999 profile of Bush by a conservative journalist who reported how the then-governor had made fun of Karla Fay Tucker’s appeals to be spared the death penalty. The journalist—a conservative, remember —wrote that Bush mocked and dismissed the woman, like him a born-again Christian, as he depicted her begging him, “Please don’t kill me!” But this is not what she had said. Bush made it up. Hurricane Katrina uncovered what the progressive advocate Robert Borosage calls the “catastrophic conservatism” of the long right-wing crusade to denigrate government, ‘starve the beast,’ scorn its purposes and malign its officials. We are seeing the results of an economic policy focused on top-end tax cuts and deregulations to reward private investors, as opposed to public investments in the country’s vital infrastructure. On the day that Katrina struck the coast, the census bureau reported that last year, one million people had been added to the 36 million Americans living in poverty. A few weeks earlier, the Labor Department had reported that while incomes had grown impressively last year, the gains had gone mostly to the top—the people with stocks and bonds and income other than wages. But the 80 million people who live paycheck to paycheck barely stayed even. It took a natural disaster to expose the stunning inequality and poverty produced when people are written off and shoved to the margins. And to remind us, as Borosage writes, of the dearth of basic investment in the boring but essential public works vital to civilization—schools, public transport, water systems, public health, and yes, wetlands and trees. We are seeing now the results of systemic and spectacular corruption and cronyism and the triumph of a social ideal—the “You get yours/I’ll get mine” mentality—that is diametrically opposed to the ethic of shared sacrifice and responsibility. Consider the story of the president’s buddy, Joe Allbaugh. When he was appointed head of the Federal Emergency Management Administration—FEMA—he described the agency as “an oversized entitlement program” and told states and cities to rely instead on faith-based organizations. Not surprisingly, the first in line at FEMA’s front door in the aftermath of Katrina was the televangelist and tycoon, Pat Robertson. Although he had only recently called for the assassination of a foreign head of state and had prayed in public for God to open some Supreme Court vacancies “one way or the other,” Pat Robertson’s Operation Blessing—sic—got one of the first faith-based grants for relief work on the Gulf Coast. As a Christian magazine has now informed us, Robertson used some of those tax dollars to help rush 80,000 Bibles to the stricken region. This is what you get from people who don’t believe in government except to aggrandize their own privilege. It wasn’t the lack of resources that prevented the administration from responding effectively to the disaster. The Washington Post’s Bill Arkin, among others, reminds us that the federal government had water, medicine, food and security at hand, in addition to the transportation needed to get it down to the coast in a hurry. The problem was “leadership, decisiveness, foresight.” And this goes to the core of the radical right’s atheist-in-the-Vatican philosophy: Denounce the government you now run, defang its powers and dilute its responsibilities, and direct the spoils of victory to your cronies in the private sector. This predatory convergence of corporate, political and religious power has taken the notion of our commonwealth —the ‘We the People’ in that magnificent preamble to the Constitution—and soaked it in the sanctimony of homegrown Ayatollahs, squeezed it through a rigged market, and then auctioned it to the highest bidder for private advantage, at the expense of working people, their families and their communities. When the right-wing apostle of no government, Grover (“Starve the beast”) Norquist appeared on my broadcast last year, I told him that I regretted having announced my retirement. With the corporate, political and religious right now exercising a one-party monopoly over Washington, I said, we are going to see such a spectacle of corruption that muckraking journalism could yet produce a new Golden Age of investigative reporting. Sure enough, not a day passes that I don’t wish we could clone The Texas Observer, plant it smack dab in the center of the nation’s capital, and loose the spirit of Thomas Paine. Paine was the journalist of the American Revolution whose pen shook the powerful and propertied, challenged the pretensions of the pious and privileged, and exposed the sunshine patriots who turned against the revolutionary ideals of freedom, equality and justice. That spirit permeates The Texas Observer . Thanks to your Nate Blakeslee, the wrongly accused in Tulia are finally out of jail. Thanks to your Jake Bernstein and David Mann, “The Rise of the Machine”— the stunning account of modern political corruption in Texas that is the basis of Tom DeLay’s power—has begun to topple the dominoes. Just imagine how such fearless journalism in Washington today could probe deep into the political machinations behind our nation’s shocking inequality, expose the corruption of our public life, and reveal to Americans just how the regime in power is hollowing out the middle class, punishing working people and shackling future generations to runaway debt. I read The Texas Observer and am reminded of the Irishman who comes upon a street brawl and asks, “Is this a private fight, or can anyone get in it?” You never let us forget that democracy is a public fight. For half a century now, you have covered that fight like no other journalists in the state. From Marshall in East Texas to El Paso in the far west, from Dallas to Corpus Christi, from Bastrop County to Deaf Smith County, you have reported on the men and women who struggle against much larger forces—sometimes alone, sometimes in the company of others, knowing that whether they succeed or not, they had to make a fight of it, had to take a stand, if justice is to have a chance in Texas. So you richly deserve tonight’s rousing celebration of the difference a free press can make. I am honored to be with you. But the evening will soon end, and just outside those doors the fight is waiting for us. Good luck—and may the dollars rain down on you from good folk far and wide, to make possible another 50 years of independent, courageous journalism.